Is there anybody out there? Or are we alone? I suppose most of us have looked up at the night sky and wondered at some time – is there any other life out there? Another way of framing the question is to ask – is the earth unusual in supporting (supposedly) intelligent life? I have investigated this question in the past (see A rare earth?) and I thought it was time to catch up on the latest thinking and update that page. 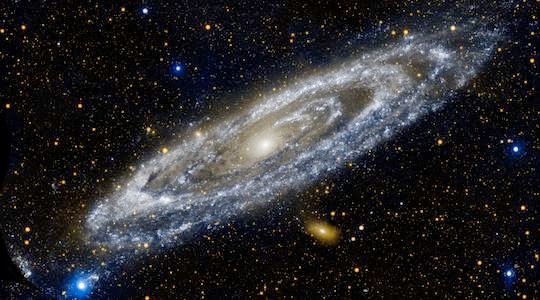 It is estimated that our galaxy contains maybe 300 billion stars and possibly the same number of planets. It is estimated by some that maybe 100 million of these might be capable of supporting life. With an estimated 100-200 billion galaxies, there are an enormous number of planets that might support life, even if most of these are way beyond our reach. Many scientists believe microbial life might form on many of these planets, though many disagree, but the big question is whether intelligent life has evolved on any of them. In view of the numbers, you’d think so. However it isn’t that simple. Scientists have identified more than 200 parameters that need to be satisfied at the same time for intelligent life to form. Planets need to be in the ‘habitable zone‘ – their solar system needs to be located in stable location in a stable galaxy, and planets must be located in a life permitting zone within the solar system – and then a whole raft of conditions must be met to permit life. Various attempts have been made to estimate how likely all these conditions are. The Drake Equation uses estimates for just 7 parameters to calculate the number of active, communicative extraterrestrial civilisations in our galaxy, but is so simplistic and gives such a wide range of answers (depending on the values of the parameters, which are largely guesswork) that it is generally recognised that its answers are not very meaningful. But it suggests that such civilisations should be common. In opposition is the Rare Earth Equation, which uses 9 parameters to estimate the likelihood of complex life within our galaxy. Its aims are a little more modest and it seems to have a better physical basis. It suggests that complex life in our galaxy is extremely rare, and perhaps we are alone. If there’s life out there, why don’t we know about it? The Fermi Paradox (named after physicist Enrico Fermi) is based on the thought that if there are many other civilisations out there, we’d expect many of them to be more advanced than us and have conquered interstellar travel. We’d expect to have detected electromagnetic signals from them, or that they might even have visited earth already. But despite decades of searching for such evidence, we haven’t found any – unless you believe some conspiracy theorists that aliens have visited and governments have kept this quiet. But statistical models suggest that civilisations are likely to be only short-lived and rare, so any intelligent life out there is likely to be too far away to contact us or not existing contemporary with us. It seems to me that the rare earth proponents have built the stronger case. Life is rare and intelligent life even rarer. It is probably unlikely that we will ever contact an alien race. It sort of feels a little sad to conclude that – it would be much more fun if there are aliens out there. Stephen Hawking has reminded us that if our history is anything to go by, visiting races are generally colonisers, exploiters and invaders, and indigenous people are the losers. So unless they are way more moral and peaceful than we are, it might be best if there is no-one else out there, or at least that they are too far away to find us. The existence of a universe that is “just right” to allow life to form is the basis of strong arguments for the existence of God. If the earth is the only inhabited planet in the galaxy, or even in the universe, wouldn’t that point more strongly to God? I’m not sure. I think a rare earth could be evidence that God set things up specially for us. But an abundance of life in the universe would be just as consistent with a creative God. Believing in God may add an extra factor into the equation. Perhaps we are right to conclude that, naturally, intelligent life is rare, if not unique to earth. But perhaps God has set things up so that life appears against the Rare Earth Equation odds. Perhaps. We can always hope …. or at least imagine. Read some more detail, and check our a ton of references, in A rare earth?.